A couple of days into Lent 2015 and it's going well so far! 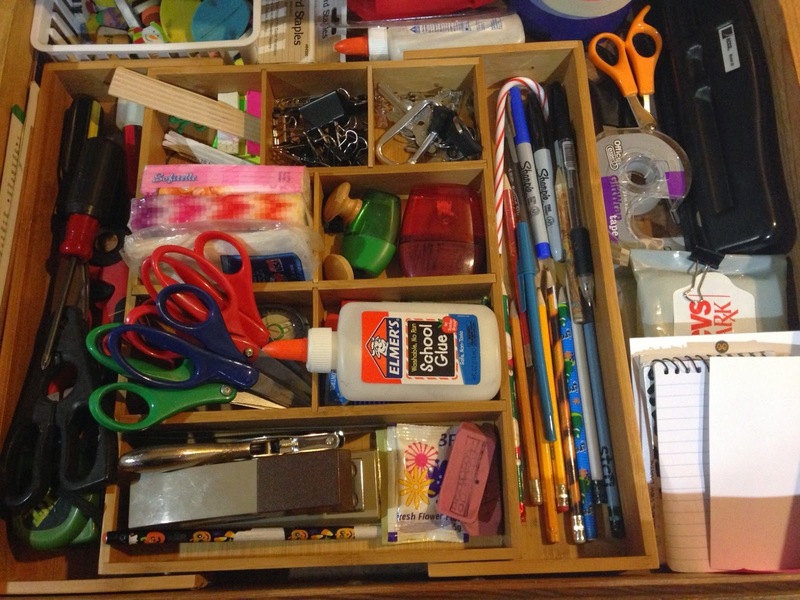 The junk drawer in my kitchen and my kitchen counters have never been neater or more organized. My boys can now find a sharpened pencil and eraser when they need one! I've also done two days of Yoga with Adriene in the mornings, just learning the basics right now (and as soon as I post this I'll go do another). Two days down, thirty-eight to go! I really need to get back to the book reviews. There's at least a dozen books I've read without reviewing them yet! 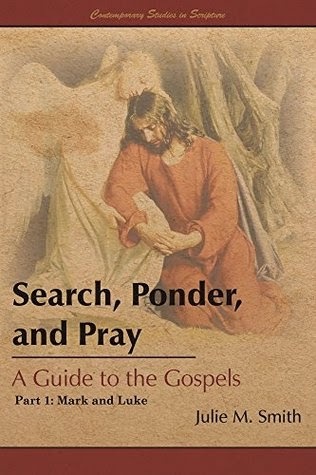 One I'm still working my way through is Julie Smith's Search, Ponder, and Pray: A Guide to the Gospels (Part 1 and Part 2). It's basically a study guide for the books of Matthew, Mark, Luke, and John, and the remarkable thing is, it's about 98% questions! The author lays a little bit of ground work and then just asks you questions to think about and consider. She'll point out other scriptures that may be relevant and invite the reader to draw connections; she'll provide a bit of historical detail and ask how that might change your understanding of the story; she'll highlight differences between the gospels and help you think about why those differences exist. It's been an incredibly valuable tool for my New Testament study this year (I've gotten through Mark and Luke and just started Matthew), and it's certainly one to be used over and over again. I'll post a full review when I'm done (promise!). Speaking of book reviews, let's do a quick one right now! As the boys have gotten busier, it's been harder to find time to read aloud to them all together, so it's taking longer to get through books, let alone a series. 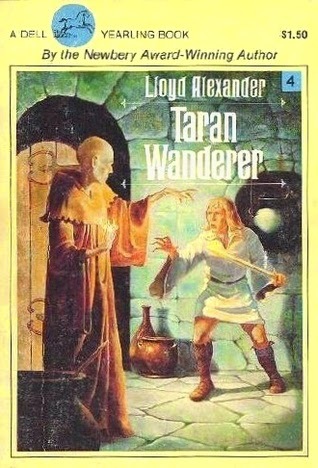 But we finished Taran Wanderer, the fourth book in Lloyd Alexander's Prydain series and the boys were immediately clamoring to start the fifth and final book. I think this is one of my favorites of the series. There's non-stop action and you can really see growth in Taran as he journeys across Prydain and encounters new friends - and new enemies - along the way. My boys liked how Taran saved Doli and the whole dwarf nation from being turned into frogs or other creatures by destroying the wizard Morda. They groaned every time Dorath and his band of marauders showed up. They loved meeting the Commot Folk, like Lucky Llonio, Hevydd the Smith, Dwyvach Weaver-Woman, Annlaw Clay-Shaper, and the brave souls of small Commot Isav, Really a fascinating cast of characters in this one. I appreciate that this book shows more complexity in Taran's character than the previous offerings. He's growing up, recognizing that the glory he thought there was in being a warrior hero isn't all it's cracked up to be, and that sometimes there's as much bravery in plowing a field or weaving a cloak, if not more. His time with Craddock was also tangled and nuanced like nothing he'd experienced before. There wasn't a simple right or wrong choice as his desires and honor and questions battled within him. Definitely one of the best of the series. I just registered to attend Northwest Pilgrims this year and I'm so excited! I can't wait to meet Jana Riess and lots of other amazing people! Early bird prices are in effect through the end of the month if you'd like to come, too!